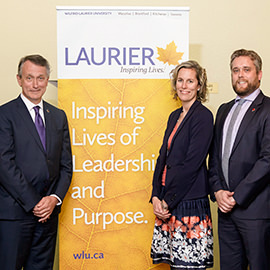 Wilfrid Laurier University’s most loyal and generous donors were celebrated at a special event hosted by Development and Alumni Relations May 25. The evening included brief keynote addresses representing a few of Laurier’s innovative undertakings, including the newly created Lazaridis Institute for the Management of Technology Enterprises, Laurier’s social innovation and social entrepreneurship initiatives, the Game Design and Development program, and the Laurier Centre for Music in the Community. A final highlight of the event was the 2016 Laurier Society Philanthropy Awards presentation. Recipients Cindy Gardner (BBA ’98) and Trevor Gardner (BBA ’98) were recognized for their generous commitment and lasting dedication to their alma mater. As devoted alumni, the Gardners continue to demonstrate a deep-seated and lasting dedication to the mission, vision and values of Laurier. Dating back to 2007, they have consistently supported a wide range of university priorities through their annual giving. To date, they have generously supported programs and initiatives such as the Lazaridis School of Business & Economics, the women’s lacrosse program, the library, as well as financial aid for students attending Laurier from out of province and for student athletes. Millards Chartered Professional Accountants were also named recipients of the 2016 Laurier Society Philanthropy Award. Millards has been a loyal supporter of Laurier, donating more than $100,000 to the Brantford campus over the past 17 years. The breadth of their support of Laurier students is vast: to date, partners of the firm have established the Millards Chartered Professional Accountants Scholarship, an endowed scholarship awarded annually to a Laurier Brantford student. Most recently, the firm and the partners made a generous commitment to support LaunchPad – Laurier’s start up incubator – in Brantford. Additionally, Laurier’s Graduate Students’ Association received a special tribute for its substantial, and ongoing, contributions. Through their support of the Graduate Enhancement Fee, Laurier’s graduate students and the Graduate Students’ Association have been supporting and enhancing the graduate student experience since 1995. Through this fund, students have contributed more than $1.85 million to date. This includes funding for five endowed student financial aid opportunities, which supported 16 students with a total of more than $28,000 this year. The event’s theme was “Innovative Laurier” and aimed to highlight the many important ways that Laurier donors provide the university with the margin of excellence that cements our standing as a leader in post-secondary education. More than 3,100 donors generously donated over $7.8 million to help enhance and expand the Laurier student experience.